Browse castor-oil suppliers by country and region. Short on time? Let castor-oil sellers contact you. SAC castor oil 100% natural and organic oil, good for skin, hair and stomach. improves immune function, boost circulation, fight skin infection and wounds, heals dry, irritated, sun burnt and acne prone, and relieve constipation. Commonly known as the lemon scented gum tree in its native country, lemon eucalyptus is a fast-growing stately evergreen growing 25 to 40 metres high, sometimes reaching 50 metres (165 ft) when growing wild. It has a variable form but typically presents a sparse, pendulous crown of narrow lanceolate leaves that are strongly lemon-scented. USES All species of eucalyptus leaves have been used in traditional Aboriginal bush medicine for thousands of years. Infusions made of lemon eucalyptus leaves were taken internally to reduce fevers and ease gastric conditions, and applied externally as a wash for the analgesic, anti-fungal and anti-inflammatory properties. Aborigines would make leaves into a poultice and apply them to ease joint pain and speed up the healing of cuts, skin conditions, wounds and infections. Appearance: Pale yellow , Viscous , Clear liquid M .I .V. : 0.25 % Max. F.F.A. (as oleic): 1.00 % Max. Acid value: 2.00 % Max. Iodine value (Wijs): 82 – 90 Saponification value: 177 – 185 Hydroxyl value: 158 – 163 Colour on lovibond in 5.25”cell: Y- 20.0 Max. R - 2.0 Max. Castor Oil Oleum Ricini Natural Herbal Essential Oil Usage: Applied externally by massaging the skin. 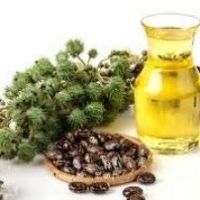 Castor oil is obtained through cold extraction method. The oil is composed of palmitic, steric and ricinoleic acid. Castor oil has laxative effects on small intestine. Can be used for skin problems and skin cleansing. Can be applied on eye lashes like applying mascara, and on eyebrows and hair roots by massaging; it contributes to the nutrition of roots.